Travel through the Mullerthal Region - Luxembourg's Little Switzerland. The Mullerthal Region – Luxembourg’s Little Switzerland has realized a project to improve the mobility of tourists. 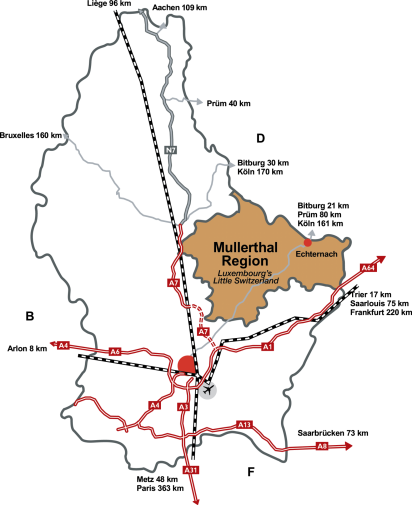 The new brochure "Mullerthal Trail Mobility 2017"is available here. If you come from Germany, you can take a train from Trier to the station of Luxembourg-City. There are trains every hour. You have the possibility to get off in Wasserbillig and continue with the bus Nr 485 towards Echternach or you remain in the train until Luxembourg-City. In Luxembourg-City you can take every 30 min. the bus number 110 (direct) or 111 (passing over other villages) to Echternach. There is also the possibility to rent a car at the station. If you come from France, Belgium or Holland, you take the train to Luxembourg-City and then the bus number 110 or 111 to Echternach. If you want to come to the region by bus, there are buses from Trier and Bitburg to Echternach. From Bitburg, the line 401 brings you directly to Echternach where you can get off at three stops. In Luxembourg-City you get every 30 min. the bus number 110 (direct) or 111 (passing over other villages) to Echternach. Take the highway A1 direction Luxembourg. After the border you take the exit Wasserbillig and then go to Echternach which you reach after 21 km. Take highway A 1 to Trier. Leave the highway in Blankenheim, then take B51 direction Trier You then come to A60 where you will take the exit Bitburg-Luxembourg. Stay on B51 until Bitburg, then take the exit to Echternachwhich you will reach after 20 km. From France, coming from Nancy, Metz or Thionville, take the motorway A 31 to Luxembourg-City, then direction Echternach. From Belgium, coming from Bruxelles, take the motorway A 4 to Luxembourg-City, then direction Echternach. If you come from Bastogne, take A 26 until the border, then Ettelbruck, Diekirch and Echternach. From Maastricht, take A 26 until the border, then Weiswampach, Ettelbruck, Diekirch, Echternach. There are direct flights to Luxembourg from Frankfurt, Munich, Berlin, Paris, London and many more. For more information, check on http://www.luxair.lu. From Luxembourg station, take bus number 110 or 111 to get to Echternach. From airport Frankfurt/Hahn in Germany, there is a shuttle bus to Luxembourg-City.